After articles like this one in Business Week, which claim that social media has no presence in consumer purchasing considerations, I thought I would take another look at Chanel and the company’s recent cinematic commercial initiatives, which have been creating a viral extravaganza for the last couple of years. I’m with Ruth Mortimer in thinking that luxury brands can use the avenues of digital media to provide vehicles for brand ambassadors and fans to influence consumer spending through viral marketing. The French powerhouse has created this buzz through their short films, which are actually cinematic commercial spots that were soon followed after by Dior, Prada and others (though with less buzz). The goal of these cinematic campaigns is to provide the greatest creative and entertainment value, which resonates best with moviegoers- a young, affluent and educated demographic that is highly valued within the advertising community. With the modern in-theater market and new technologies of dispersion, the quality of cinema advertising has soured exponentially. The challenge was to create something worthy of consideration from existing or potential luxury markets. Stopping short of creating a Facebook page for the brand, Chanel instead focused its efforts on creating brand-worthy commercials told from the perspective of the House of Chanel, which were also considered entertainment-worthy by the fans. Fans (and critiques) took over from there, building hype, passing the video campaigns across the internet and voting, tagging and commenting on what they saw. The immense budgets of these films shows just where the brand’s money-maker lies: fragrance. The brand sought to update the image of No. 5 for the American youth market, who typically viewed this fragrance as a relic from grandma’s dating years. Loaded with strong, opulent and innovative visuals, the “fashionable” director created the ad film as a movie trailer spanning more than 2 minutes. Most modern consumers associated the fragrance with the romantic lifestyle of mid-century France. In an effort to stay relevant and up-to-date, avoiding the classic undertones, the commercial is set in NYC instead of Paris, and all dialogue is in English. Themes of romance, escapism, adventure, mystique, an example of exquisite haute couture, the use of men’s wear and even a little high/low-class rendezvous is inserted to balance the updated image with the brand history. Various postings of the commercial short have collectively received more than 2 million views on YouTube alone, with over 1,000 comments. The perfume continues to be one of the most widely purchased fragrances of all time. Following the success of the initial campaign, Chanel developed a second cinematic commercial spot, this time to introduce a modern fragrance to capture the essence of the brand for today’s market, without interfering with the positioning of the “Old Classic,” No. 5. The short film for Chanel’s Coco Mademoiselle fragrance focused on historic references to the brand’s namesake, Coco Chanel, using a modern actress and a timeless Parisian set. Coinciding with the launch of her 2007 movie, Atonement, Keira Knightly starred in the spot as a variation of Coco herself through imagery associated with the codes of the brand: the men’s shirt, the classic hat, the famed mirrors of Chanel’s Paris apartment, the camellias woven into a bracelet; all with a touch of elegance, sophistication and romance. There is even a focus on mix-and-match, where the actress removes her ankle bracelet and uses it as a necklace (it contains pearls, of course). Silly, yes, but it gets the point across: this fragrance represents the modern ideal of Chanel herself. Demonstrating less viral activity, the commercial film received fewer than half a million hits on YouTube, but the associated print ads created quite a buzz in the blog world. After the success of the 2006 campaign staring Nicole Kidman, Chanel again sought to produce a blockbuster ad that would address the entire international community while building hype for the upcoming release of the biopic “Coco Avant Chanel” (Coco Before Chanel). The 2009 commercial film features Audrey Tautou, star of Amelie and The Da Vinci Code, and is directed by Amelie’s Jean-Pierre Jeunet. Unlike the Kidman film, the Tautou version includes no dialogue, with the exception of a night train conductor asking for the starlet’s passport in French. The rich sound and visuals tell a story of an independent, young first-class traveler who falls in love with a mysterious man in her neighboring train cabin on their way from the Limoges Bénédictins station in France to Istanbul. The fellow traveler is seduced by the young woman’s scent, No. 5. This commercial has all the entertainment value of the original Kidman spot, but aside from featuring one solitary pearl, it lacks the traditional codes of the brand. What it achieves is bringing home the message of romance to No. 5 for the international community, featuring today’s most famous young French starlet together with the classic love song, Billie Holiday’s “I’m a Fool to Want You”. Just released this month, the film already has a combined YouTube hit rate of less than 100,000 and enough pages of comments to show that people are engaged, for better or for worse. That doesn’t indicate a very clear understanding of viral marketing, does it? Frankly, I was a little surprised that the site did not offer embedding capabilities, although I understand that the brand doesn’t want their “commercial” to appear just anywhere. However, to outwardly restrict the very act that makes these videos so successful is a bit shortsighted, if you ask me! The iPhone is expected to be the shopping norm by December 2010, according to today’s news. Today’s Women’s Wear Daily reports that YOOX has been the latest to initiate its online shopping portal via the iPhone. Other retailers, such as Shopstyle, Amazon, Sears and SVC have long since developed their own Smartphone applications. In the meanwhile, for those who haven’t developed their own iPhone applications, companies such as Demandware are crafting retail websites to maintain functionality across a range of Smartphone devices, including the iPhone, BlackBerry, or Palm. Even if Smartphones only make up 4% of new mobile phone sales by the end of the year, as predicted by analyst Ramon Llamas of International Data Corp, it makes sense that the majority of those buyers are also luxury shoppers. They’re going to be expecting something from their favorite brands, no? What does this mean for our luxury players? Their products are available online through various retailers, and brand enthusiasts can watch the latest fashion shows (with added details) and read the headlines on CondeNast’s Style.com application. If, by chance, I happen to leave Milan and have a Chanel shopping emergency in Paris, I can google the address, so the location finders are not terribly original either. What I’m saying is this: Props to you at Chanel and Ralph Lauren for getting your own apps out there, but is that all you got?! Basically, I want the luxury retailing experience that is just-for-me, and I want the insider information on the brands I love. Dolce & Gabbana has made headway on this through the creation of their online magazine Swide.com. Let’s get that into an iPhone application, combine it with the online retail capabilities currently being developed for the brand by YOOX, and we’re in business! The fashion and luxury industry was once a cutting-edge beacon of hope in the advertising world. The desire and longing it was produced with such buzz now seems like a stale yawn in today’s virtual environment, and I think that, unless the big guys step up and start innovating, their current model of following the mass market online will do more to devalue the idea of luxury than any 70% off sales could have done in the early days of the recession. The fact that most luxury brands have limited to no online presence and retailing capabilities, much less their barely existent Smartphone presence, gives me reason to worry not only about the future of my profession, but also about the future of the luxury industry itself. Where I see another real promise is in the fashion media industry, and they are definitely stepping up to the challenge. I love fashion and cultural magazines, but I hate carrying them around (especially with today’s weight limits for carry-on items). If I can squish my favorite magazines down into my iPhone, well, that’s something I’d definitely pay for. I’m really hoping that the rest of Conde Nast’s media portfolio and others follow suit. Vogue wins again! The following is a case study I developed, investigating how one of the leading French Luxury companies fits into the proposed business model framework. I’m especially interested to see how CHANEL will perform in the digital environment, since they have taken the initiative to dip their toes in the 2.0 waters. If anyone has any thoughts on this, I’d love to hear them! French fashion has long been reflective of social and economic hierarchy, illuminating the distinction among classes. Beginning with the Royal Court of the Sun King, France became the capitol of rich fashion. 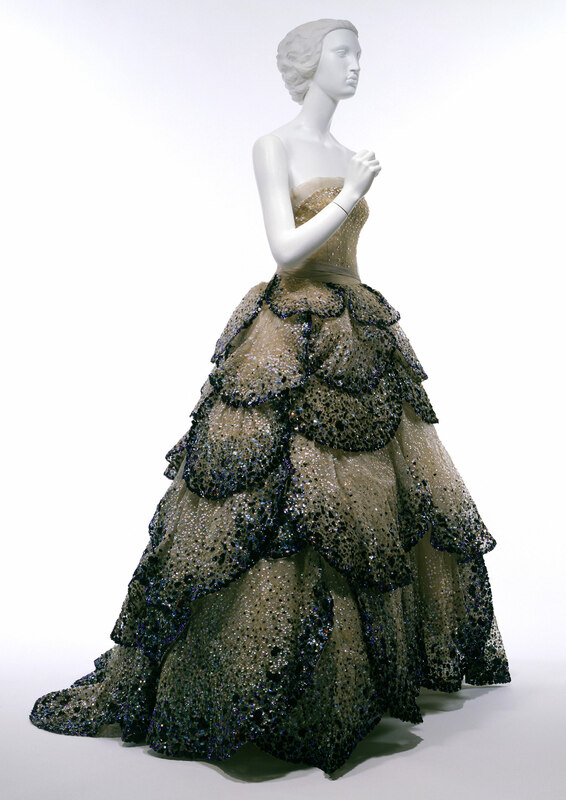 After Charles Worth created the business of haute couture in the 1800s, Paris became the creative center for a business model that has evolved greatly, yet still remains centered around the spirit of haute couture. Haute couture is identified as unique pieces constructed with precious materials, made-to-measure, and made for special occasions- not daily wear. A dress of this nature today should run you on average between 20,000 and 30,000 euro and up. Where there were once more than 30,000 clients per year for the highest form of French fashion, today there remain less than 3,000, and most of these are irregular clients. Hence, haute couture is not a big business anymore; it is unaffordable and impractical, as there are fewer and fewer occasions in today’s world to wear such items. Therefore, it has become much less profitable than it once was, having lost the link with modern life. Most companies that made their name in haute couture today sell mostly accessible products and democratic accessories like lipstick, perfumes, and so on. However, to continue to sell these more “basic” goods at high profit margins, they must continue to produce high fashion. People are now buying the legacy of couture, rather than the couture itself. Therefore, to make the big bucks selling goods at the bottom, you must be positioned at the top. According to French law as of 2008, 50 garments per season must be produced by hand, by at least 20 skilled in-house workers for a fashion company to be considered a house of haute couture. (This model is changing under the current economic situation, in order to protect the existing haute couture legacy; too many couturiers were closing their doors under the weight of these expensive restrictions.) These companies lack a bottom-up business model, and have no second-lines: consider French powerhouses Dior and Chanel, as opposed to Armani, Ralph Lauren, Dolce & Gabbana, etc. Brand images and communications demonstrate a high level of arrogance and provocation. Have you ever wondered how or why that “crazy stuff that nobody is ever going to buy” makes it onto the catwalk? The most elaborate and provocative designs are taken onto the runway because the goal is not mass profitability, but to demonstrate creativity and uniqueness. Consider the wild boys Jean Paul Gaultier for Hermes, or John Galliano for Dior (below). In fact, most clients are unaware of exactly who is the designer behind today’s major labels. 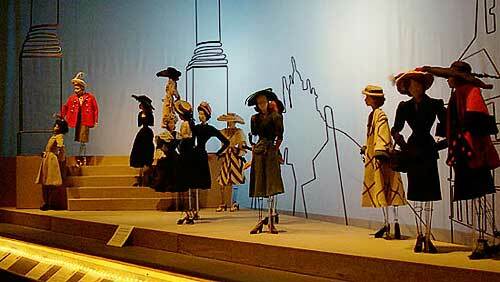 Instead, they typically know what celebrities are wearing them (the Poiret legacy lives on!). To summarize, the French business model is derived from a long tradition of craft and individualism. Couture was the original product of the French fashion and luxury system, which is now integrated with accessories. The image of sophistication and provocation are used to produce the sense of luxury, which is what the companies are selling. Viola!